The bar has been raised. This is a very good car. Let me tell you why and let me tell you why that’s important. I had the opportunity to participate in the exceptionally fun Ford Focus Challenge in Vancouver earlier this year, and I already told you quite a bit about the Focus. I’m going to use some of the material from that review, and add to it – being able to spend a week with a car fleshes out some of the questions I had lingering from the one day I spent with the Focus this summer. The 2012 Focus starts at a very reasonable $15,999 for the S trim level sedan, and goes up to a still-reasonable and very competitive CDN $30,060 (including taxes!) for this particular Titanium trim level 5-door hatchback which was essentially loaded up with every option from I could see online. 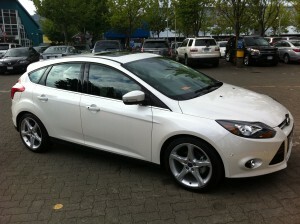 All 2012 Focus models include the new 2.0 litre inline-4 engine. It’s a modern unit, using direct injection and some other goodies to make a decent amount of power, and designed to be extraordinarily fuel efficient. The engine cranks out 160 horsepower at 6500 RPM and 146 lb.ft of torque at 4450 RPM – these numbers are enough to make this an agile little car, and I rarely found myself needing more to do anything I threw at this car. In terms of the competition in this class, but I think that the balance between flexibility, power and fuel economy is near the top of the class. 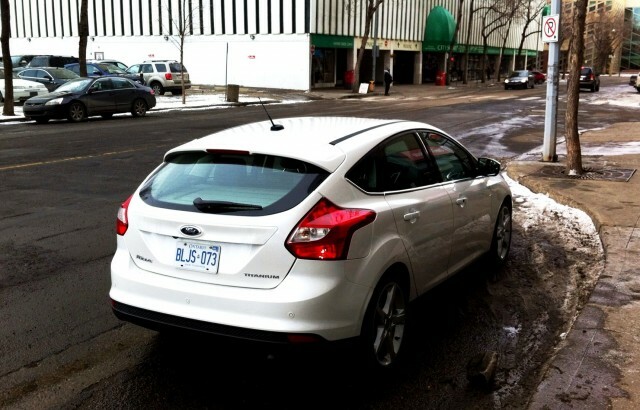 Speaking of fuel economy, the Focus is rated at 7.2 L/100 km in the city (about 33 mpg) and an astounding 4.8 L/100 km on the highway (49 mpg). Those are impressive numbers and Ford says it’s an 18% improvement over the previous model’s economy. All this is with the automatic transmission. And this automatic transmission isn’t the old-school one – they’ve brought some new goodness to the table here as well. 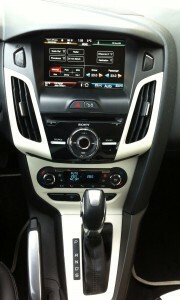 It’s Ford’s new 6-speed PowerShift dual-clutch unit – I found the shifts to be quick and relatively very smooth. The transmission did seem to be quite economy-centric, and I felt it liked to head for the higher gears more often than I wanted during spirited driving. The upside is that this car (according to Ford’s notes) can drive 977 km (607 miles) on one tank of gas on the highway. That’s pretty rad! There is an S setting which would, logically, stand for Sport and should hold the gears longer – I found that this worked but didn’t convey as sporty of a character as I wanted. Unlike some other cars’ “S” settings, it doesn’t transform the driving experience. I also take great issue with Ford’s manual gear changing mechanism for their automatics and I’ve droned on about it before – it’s a goofy rocker switch on the left of the shift lever that you activate with your thumb and it never feels natural, and doesn’t even begin to approach a sporty way to change gears. I miss paddles or at least a slap-stick manual gate for the lever. 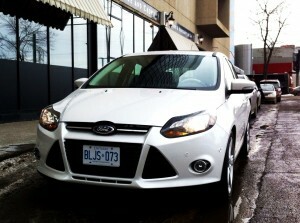 The 2012 Focus draws on what Ford calls “Kinetic Design” language, which talks about the flow of energy, blah blah blah. In subjective terms, I would say I appreciate the new styling direction. It’s a nice, modern take – it has character without taking too many risks and possibly alienating buyers. I prefer the hatchback over the sedan. Both share the same front end, with its menacing trapezoidal grille treatment – they definitely look like they mean business. A number of people commented on the aggressiveness of the grille and appreciated that it does something different. I really like the rear end of the hatch – it has a little spoiler and just the right kind of curves to make it look spicy. It’s really difficult to make a compact sedan look spicy, because there’s always the nasty business of a trunk. Ford uses wrap-around tail-lights which look great on both, and they also use a wrap-around headlight design which they call Dragon Eye design. That’s a bit rich, but still, it’s a nice look. It’s aggressive, modern, sleek and it works. I noted that the wheel choice really makes a difference on the Focus – and they’ve got some good ones. You can opt up to 18″ rims on this car, which looks hot – they ring in at $430. This example came in White Platinum Metallic Tricolor, which does the curves and angles of this new body style justice – I love this color and I quite like the new look. The materials used in this car are upscale in terms of this class, and the dash is fitted with a soft plastic with a nice texture and grain on it. I felt that the fit and finish were exemplary throughout the cabin. As I’ve noted with other vehicles, I do like the ambient lighting that Ford offers in its recent models. The fact that you can change the color of it with a button had my kids thrilled. This tester had the two-tone leather interior. I quite liked the contrast on the dash, and it was nice to look at. When it came to the seats and the steering wheel I thought this color combination was a bit too much. It looks like someone took out Shamu and brought him to the taxidermist. No more Free Willy! That said, most people that sat in the car quite like the striking contrast. Judge it for yourself. Regardless of the color, the seats are excellent. They’re very comfortable, with a nice balance between firmness and cushy-ness, but also offering a notable amount of bolstering. The front seats have 5-position heaters, and the driver’s seat is power adjustable. The dash is well-designed – it has some interesting twists and turns, and tries to do some normal things differently – I liked the new shapes and contours I saw, and everything was relatively user-friendly, if not a bit busy. I also felt the whole cockpit is very driver-centric – that’s not a complaint, just an observation. The instrument cluster is simple – two big easily readable analog gauges on the outside, flanking a small centre screen which is above two small gauges. I like the steering wheel very much. It’s comfortable to grip, and a good size. The center stack starts with the touchscreen on top – below it are the media controls and then the climate controls. The center console has the shift lever up front, with a parking brake lever to the left of it. Behind the shifter are seat heater controls, a 12V plug, and finally two cupholders. I’m not a big fan of the bulkiness of the shift lever – it’s tough to explain, but somehow, it doesn’t feel sporty. I really liked the well-upholstered center armrest – it looks good and feels even better. In terms of headroom, I felt the front was average – I’m guessing there would be more in a model without the sunroof, but it was fine for me. Let’s get the MyFord Touch system out of the way. I’ve talked about this system at length in my previous reviews, especially with the Lincoln MKX, and I continue to have the same opinion of it. It’s promising technology, but there are too many issues with the response time, and too much layering of access, to make it a great system. The potential has always been huge. The system does control 4 major areas of function – the audio/media system, the navigation system, climate control and the phone functions. The screen is located at the top of the centre stack, and is easy to read and to reach. And on that note, this system is significantly improved for 2012 models and for the future, and the improvements are firmware-based, not hardware based, which means older ones like this can be upgraded. Good news! Integrated into the screen is the rear-view camera which shows distance markings and the very useful trajectory lines, and is paired with audio warnings from the distance sensors. 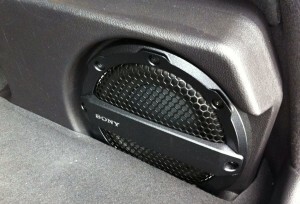 The stereo is a Sony-branded system, which sounds really, really good – you have 10 speakers, including a center channel and a sizable subwoofer in the trunk. This system sounds crisp and clear. Audio sources are AM, FM, Sirius satellite radio, USB (2 outlets!) and SD cards, as well as Bluetooth streaming. The climate control is a nice, simple dual-zone system that was very accurate. A lovely tilt/slide sunroof rests overhead, and next to its controls you’ll find a 3-setting HomeLink transmitter for your garage door opening convenience. The Focus has the MyKey system, which is a great idea – and I’ve talked about it in other Ford vehicle reviews. It allows parents to program their kids’ keys to limit the top speed of the car, as well as allowing them to control the maximum volume of the stereo system AND the stereo remains muted until the seat belts are buckled up. They’re certainly not draconian measures, and although they’re likely to piss off the average teen, it’s a small price to pay to be able to take the car out, and it would give me peace of mind as a parent. Forward thinking! The information screen between the gauges is controlled by steering wheel buttons and it is very sharp and easy to read, as well as easy to navigate. Other manufacturers could learn a thing or two here. The screen gives you access to two sets of trip meters, fuel economy (average), trip timers as well as system settings, outside temperature, odometer reading and shift lever position. The steering wheel has two D-pads for media and the driver information screen. You’ll also find buttons for the cruise control, phone and hands-free operations. The car comes with a keyless FOB, which allows you to open the car by just touching the handle, and of course that brings you a push-button ignition. Power windows and mirror controls are on the driver’s door – the power door lock switch is centrally located – you all know how much I hate that. Some under-the-hood tech for you? A spanky little innovation that they call active grille shutters. The car figures out exactly how much fresh air the engine requires at that particular point in time and adjusts the grille to open and close as it sees fit. That allows the engine to warm up quicker, and therefore more efficiently – and this will also slightly aid in the car’s aerodynamic presence whilst driving. An interesting concept, to be sure. How much impact it has, I can’t say, but it certainly is food for thought. Cool stuff. It seems like a shame to leave this tech bit to the end, but it’s certainly not the least of the goodies. This Focus had the Active Park Assist, which will not only find eligible parking spaces for parallel parking, but also will coach you into the spot, doing all the steering wheel work itself. It has to be experienced to be appreciated, but let me put it this way, I’ve tried it about 20 times, and it has always parked me perfectly – perfectly spaced, perfect distance from the curb. If you have a phobia around parallel parking, the Parking Technology Package is the best option you could ever get. Never mind that – for $600, considering it includes front and rear parking sensors, the rear camera and the Active Park Assist technology, you’d just be downright silly not to check off that box. Plus it’s a great conversation piece, believe me. Storage space seems limited at first, but it’s not a big car. You’ll find two cupholders in the centre console. There is a glove compartment and a nice, usable and deep centre console bin, and that’s about it, short of small door pockets which incorporate little cupholders. The space in the hatch is great, and allows for plenty of cargo – of course the rear seats fold down (typical 60/40 split), and make it a voluminous space to work with. I appreciated two great inside grab handles on the hatch – they make it easy to close that lid. I liked that the hatch space was nicely upholstered and offered simple, smooth surfaces – no surprises and less things to get in the way of maximizing your ability to use the space. In the back you’ll find 3 headrests and seatbelts, but truly only seating for two adults. The middle seat is small and tight. That’s not a criticism – that’s standard for this class of vehicle. Those seats are very comfortable back there – they could use more bolstering, but all in all, it would be a nice place to be on a road trip. The beltline gets quite high toward the back, so it seems pretty cozy sitting back there. The legroom is OK, nothing to write home about. The headroom is good. 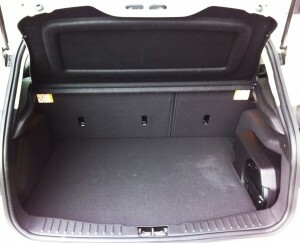 In terms of storage, there are decent door bins and the standard seat-back map pockets for the rear seat passengers. There is a 12V plug at the back of the center console. A couple of details really stood out for me in the back seat – little things that make a difference. One was a well-shaped and designed armrest in the door. Often rear seat passengers don’t find themselves with anywhere to put their outboard arms, and this is a great place to put your arm down. That will make a difference on a road trip. Also, there are two brilliant little storage bins on each side – one by the passengers knees and one higher up at waist level. They’re just little nooks and crannies, but I love that they’re using them as storage where it’s useful. Finally, the middle seatback folds down to make a great floating armrest, and it has two cupholders in it. All in all, the rear seat in the Focus is not a bad place to be. Got kids? Sorry to hear that. I kid, I kid. I have three of my own. You’ll find 2 sets of LATCH anchors, as well as 3 high-mount anchors on the back of the seats. Fitting 3 kids’ seats will be nigh-impossible but can be squeezed in – 2 are just fine. In Vancouver, we were shown how Ford uses recycled jeans and cotton in the carpet backing and sound-dampening materials, and I believe in the seat fabrics as well. In addition, a huge number of components throughout the Focus are made of recycled materials, and are further recyclable after the life of the vehicle. They are also using greener materials, such as soy foam seat cushions – I’m certain that would delight the granola-eating, tree-hugging crowd if they were ever stranded on an island with a Ford Focus – you could just start eating it. Mmmm, seat cushions. MyFordTouch has a favorites screen – there you can assign up to 22 shortcuts to anything you want within the system – favorite phone numbers, radio stations, destinations for the nav system, anything you see fit. That’s pretty cool, but what I really like is that any two of them can be assigned to little buttons on the steering wheel. They simply have a star with the number 1 or 2 in it on the button – and whenever you hit that button, the system will immediately achieve what you’ve assigned to that button – call that favorite number, go to that favorite station, pull up directions to that favorite destination. Whatever you choose. Now THAT’S convenient. The Focus uses ample amounts of backlighting throughout the car – perhaps more so because they want to show off the ability to change the colors of the lighting. But I actually appreciated the fact that the door bins are lit. Makes a big difference when you’re looking for a parking pass in the dark. I really enjoyed the day-to-day driving aspect this car delivers. It is comfortable, and competent. The engine does work hard to get things going quickly, but the car never felt strained. Considering the weight of the car versus the numbers the engine puts out, it felt right. The upcoming Focus ST will solve any issues around lack of power, if you feel that’s the case. That car, to me anyway, may be the perfect small car. It will also be significantly more money than the regular Focus. The handling is excellent on this vehicle. It always felt planted and was very confident on every surface, including ice and snow. Ford was kind enough to put excellent winter tires on it, which is just common sense for anyone living in a winter climate. With those tires, I can honestly say this is a fantastic winter car. The electronic whizbangery keeps things steady when you’ve pushed it a bit too far, but it takes quite a lot to get the Focus out of joint. There was a bit of body roll, but to be clear, it’s nothing irritating and nothing that would ever make you unsure about this car’s capabilities. AND the trade-off is well worth it – considering how short the wheelbase is on this car, and how well it handles, I was very impressed with the ride quality. The Focus’ has new, electronically-assisted power steering which is substantially more flexible and adjusts to the driving situation. It’s nice and light in slow driving, like a parking lot, and it varies the assistance when it needs to. I thought it felt like a well-balanced system and I think the steering is at the top of the class – that said, the competition isn’t far behind – many vehicles in the entry level classes have migrated to electronic steering these days. The Focus also sports a torque-vectoring differential. This pushes torque to the wheel with the most grip, and makes a big difference in performance driving. Torque vectoring isn’t a brand-new concept, but I think it might be exclusive to the Focus in this class of vehicle – please correct me if I’m wrong about this. You’ll find it on more expensive, performance-oriented cars (it’s a much-touted option on the Audi S4, which easily costs twice as much as this car), so it’s refreshing to see it on this vehicle. Standard equipment. Sweet. Drive the car aggressively, and you’ll feel the difference that it makes. That brings me to the one big issue I had with driving this car. Yes, I typically commute in relatively slow-moving traffic, and that’s most of my driving. But I’m also a driving enthusiast, and there are definitely times where I like to step on it, and push a car closer to its limits. Considering that the Focus has pretty high limits, and is a very competent car, I felt that Ford has done a little too much to curb your enthusiasm in terms of wringing a little more out of the car. Let me explain. 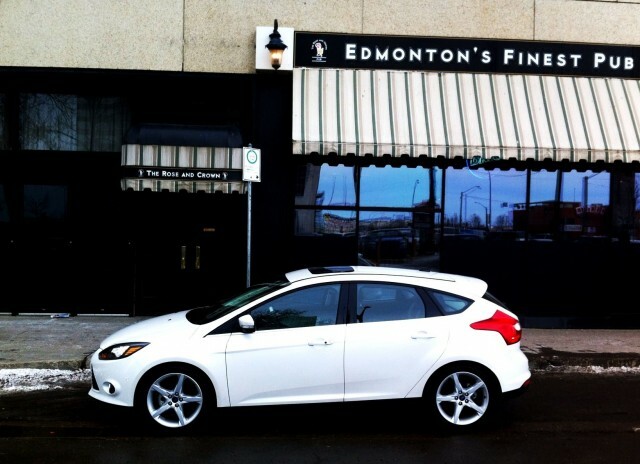 The Focus is equipped with a dual-clutch transmission – that’s great stuff, and very efficient. Yet, even in Sport mode, it tends to lean toward efficiency rather than sportiness. 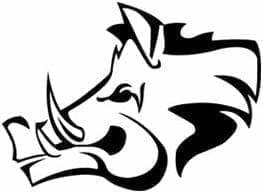 It will hunt for higher gears, and often leave you wanting a lower gear. It’s a very smooth transmission, and I never felt it got lost trying to do its thing, so that’s good, but somehow it left me wanting more. I know the Focus ST will be a sharper tool in terms of pointing toward performance and sporty driving, but this Focus isn’t a lame duck – it has the ability to do much, it just seems like Ford is afraid to let us use all of it. The driving experience is very pleasant, but could be so much more if Ford just let us. Not many of these – but here goes: the D-pads on the steering wheel curve over the top of the center spoke of the wheel, and I found them awkward to use. A weird ergonomic oversight. The front cupholders have no adjustment mechanism, so they’re one size, and my mug kind of rattled around in there. Also, there are electronics RIGHT in front of the cupholders – the seat heater controls and a lidded 12V plug. As your delicious beverage jiggles around in those cupholders, you might also be finding it splashing onto those electronics – which is not cool. The rest of my issues can be filed under the “Please Ford – let the Focus have some fun!” category, as per my complaint in the Driving section. I’ve cursed the Ford manual shifting mechanism on their automatic transmissions before, and I continue to hate it. The thumb-actuated rocker switch on the shift lever is just weak. Either offer paddles or a simple slap-shift manual gate on the lever. Please. I beg you! Nobody who wants to sport it up a bit will ever enjoy using that manual shifting method. I don’t appreciate the effort involved in turning off the traction control. If you are asking why I’d want to do this in the first place, just skip this paragraph. Anyway, there is no button for this. Turning off the traction control requires one to navigate through the driver information screen – first to “Settings”, then to “Driver Assist”, then to “Traction Control” and finally you have to select “Off”. This is infinitely hemorrhoidal, and then to add insult to ….. insult, you’re rewarded with a traction control that isn’t truly defeatable. Some of the electronic grannies remain in their rocking chairs, keeping a watchful eye on your and your silly antics behind the wheel, ready to scold you and wave their canes threateningly if you let things get out of hand. Where’s the trust, Ford? 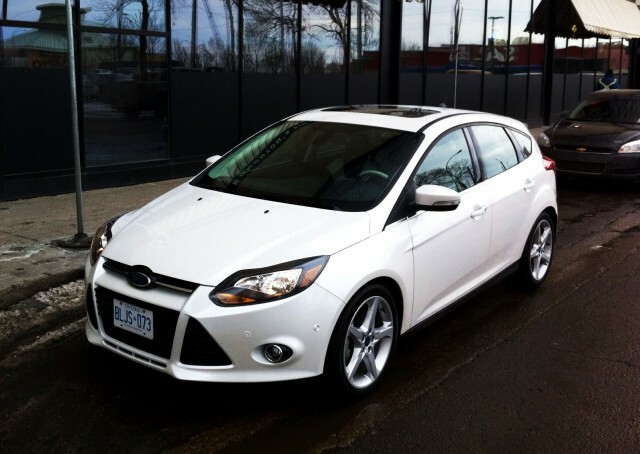 I have no hesitation in saying that I loved the Ford Focus. I was wondering what Ford would come up with – because my little sister-in-law drives a first-gen Focus, and it is a turd that can’t be polished. Ford has come a long way since then – as a company, and with the Focus as a product. This is a car I would want to own. I give the Focus an 8 out of 10. Considering the amount of quality and standard equipment in terms of tech and safety that comes baked into this car, I would recommend anyone buying in this class to have a close look at it. On top of that, considering the amount of luxury and toys you can add to load it up as this particular one was, and barely crack CDN $30,000, this car remains competitive at all trim levels. You don’t have to head up to the Titanium trim level to get a lot of the goodies here, and you can get into the car for a great price. Add what you want, and you’re still in the ballpark. WAF (Wife Acceptance Factor) was very high for this car as well. Aimie liked the ride, the comfort and absolutely loved the Active Park Assist feature. If that isn’t a selling feature, I don’t know what could sway someone. I’m truly stoked about the arrival of the Focus ST – it’s fantastic that it’s making it to North American shores, and it will very likely be a strong rebuttal to the few niggling arguments I had while driving this model. In the meantime, although I feel that some of the Focus’ sporting abilities are hidden behind a couple of Ford’s corporate decisions, this is a fantastic car and shows that Ford is serious about making a quality vehicle. I experienced a well-built, solid car – with no squeaks or rattles, exemplary fit and finish, and sporting comfort and tech goodies that unquestionably set the bar for this class.